Gallbladder is an organ of human digestive system, responsible for storing the bile processed by the liver. It can store up to 50ml (milliliters) of bile and concentrate it over time in order to digest the fats. All organs in human body may develop different disorders and diseases, including gall bladder. Conditions such as gallstones, gallbladder cancer or porcelain gallbladder sometimes may be resolved by medications. However, when this is not the case, patients need surgical intervention, usually to remove the gallbladder if the condition is seriously bad. Surgical removal of the gallbladder is also known as cholecystectomy. Many surgeons will not tell you how much time it’ll take to completely heal from gallbladder surgery. Most of them will answer shortly something like “until your incisions heal” or something similar. In the 80s, when gallbladder surgery was still in its early days, cholecystectomy was very painful for the patient and quite complex for the surgeon. 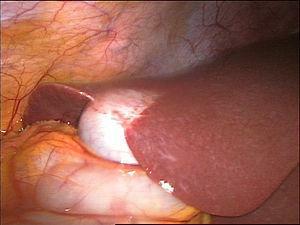 To remove the gallbladder, surgeons were required to make large incision on the abdomen. Because of the size of the incision, patients needed a long time to recover after this surgery and the pain patients felt make the recovery even longer. Often, patients suffered from abdominal inflammation which complicated thing and recovery furthermore, so patients needed additional time to recuperate, get up and walk on their own. Modern medicine, however, is dramatically improved since the 80s. Gallbladder surgery has advanced significantly and now they leave small incisions during laparoscopic surgery. Surgeons make very small incisions in patient’s abdomen and use a small camera to see inside the abdomen. Using small and delicate surgical instruments they are able to remove the gallbladder, without touching or damaging any other organ in the abdomen. All these measures ensure less healing time than after older gallbladder surgeries. Patients don’t have large incisions and recovery time is therefore much shorter. Also, since none of other organs are hurt during the procedure this also shortens the time to heal properly. Most patients feel fine after a day or two at the hospital and can go home after that. In order to decrease the recovery time after gallbladder surgery, there are some special diets before and after the surgical procedure and you can consult your doctor about it. Try to be focused to recovery and avoid nervousness and anxiety before, during and after procedure, since this is also known to promote healing process and speed up recuperation. Previous medical conditions such as diabetes or hypertension may cause a bit longer recovery than in people of good health. Acalculous Biliary Pain - Other Options Besides Surgery?